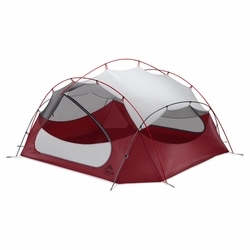 MSR Papa Hubba NX 4-Person Backpacking Tent. New to the Hubba™ family, the MSR® Papa Hubba™ NX 4-person backpacking tent offers maximum livability for four in a tent that’s light enough to take into the backcountry. The tent weighs just 2.67 kg / 5 lb 15 oz—less than .7 kg / 1 lb 9 oz per person—and packs up smaller than most 2-person tents. Whether your group needs to break up your Half Dome hike with an overnight stay in Yosemite, or you’re planning a family camping trip in the backwoods, the 3-season, freestanding Papa Hubba tent offers plenty of room and livable comfort for all. Inside and out, the tent is engineered for performance, from the large side windows you can sit next to comfortably, to the optimized, symmetrical frame geometry that protects from side winds.